The evoflame® effect gives the impression of a deep and rich flame picture with a hot ash effect fuel bed via its unique reflectivity. The flame picture which is produced using LEDs can provide up to 50,000 hours of running time. It is fully adjustable through the high and low settings when using the E-Touch remote control. e-touch® allows complete controllability of any floor or wall mounted suite product. 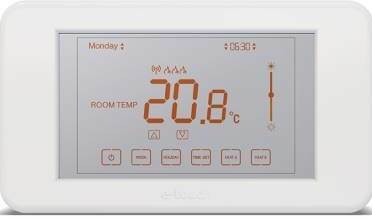 The control system is a fully portable, rechargeable bluetooth based touch screen unit, featuring a built-in thermostat enabling you to regulate and maintain the selected room temperature with ease.